Although Twain was confounded by financial and business affairs, his humor and wit were keen, and he enjoyed immense public popularity. At his peak, he was probably the most popular American celebrity of his time. In 1907, crowds at the Jamestown Exposition thronged just to get a glimpse of him. He had dozens of famous friends, including William Dean Howells, Booker T. Washington, Nikola Tesla, Helen Keller, and Henry Huttleston Rogers. Fellow American author William Faulkner is credited with writing that Twain was "the first truly American writer, and all of us since are his heirs." 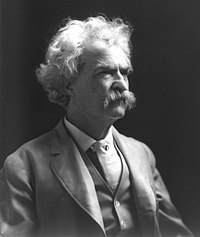 Twain died in 1910 and is buried in Elmira, New York. This article is licensed under GNU Free Documentation License.